With 365 frontage along the busy US 78 Highway corridor, these parcels offer 5.44 fenced acres with a brick structure and several other storage structures. Brick ranch structure was former residence. Property is cleared, level, grassy and has a gravel parking area. 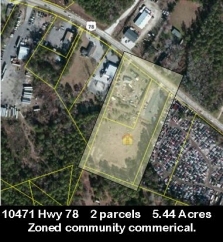 Currently zoned Community Commercial by Charleston County and reflects good to average commercial development potential. Two parcels: 385-10-00-004 (1.82 acres) & 385-10-001 (3.62 acres).